ORNL Director of Technology Transfer Michael Paulus, Eck Industries President Kiley Eck Hayon, at the licensing ceremony. 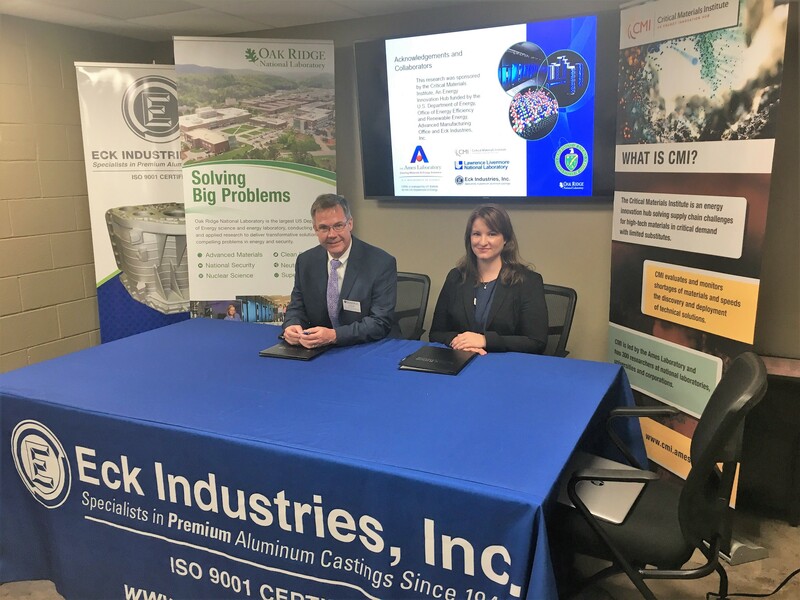 OAK RIDGE, Tenn., and MANITOWOC, Wis., June 7, 2017—Wisconsin’s Eck Industries has signed an exclusive license for the commercialization of a cerium-aluminum (Ce-Al) alloy co-developed by the Department of Energy’s Oak Ridge National Laboratory that is ideal for creating lightweight, strong components for advanced vehicles and airplanes. The patent-pending alloy was developed as part of DOE’s Critical Materials Institute (CMI) and makes use of cerium, the most abundant rare earth element. Cerium makes up as much as half of mined rare earths, yet has less value than co-mined elements like neodymium and dysprosium that are in high demand for advanced energy technology applications. Creating new uses for cerium supports both domestic rare earth mining operations and the US manufacturing sector. Scientists at ORNL, working with Eck Industries and researchers at DOE’s Ames and Lawrence Livermore national laboratories, developed the Ce-Al alloy that is easy to work with, lightweight, corrosion-resistant, and exceptionally stable at high temperatures—making it ideal for automotive, aerospace, power generation, and other applications. Testing has shown the Ce-Al alloy is stable at 500 degrees Celsius. Withstanding higher temperatures means, for instance, that engines made using the alloy can run hotter with more complete fuel combustion while being lighter in weight, which advances fuel efficiency. Ce-Al does not require additional thermal processing during the casting process and takes advantage of abundant, low-cost cerium, said ORNL scientist Orlando Rios. Casting with the alloy can be accomplished using standard aluminum foundry practices and without a protective atmosphere. “The alloy is thermodynamically stable,” Rios said. The cost of heat treatment and the additional machining required due to thermal distortion can make up some 50-60 percent of the cost of casting traditional alloys. Energy costs could potentially be reduced by 30-60 percent compared with traditional casting processes, he noted. The Ce-Al alloy’s potential marks a significant departure from post-casting heat treatment and age-hardening approaches developed over some 100 years and can significantly advance manufacturing competitiveness as result, Rios added. Eck, a privately-owned business based in Manitowoc, Wis., was involved in developing and testing of the alloy under a separate agreement. 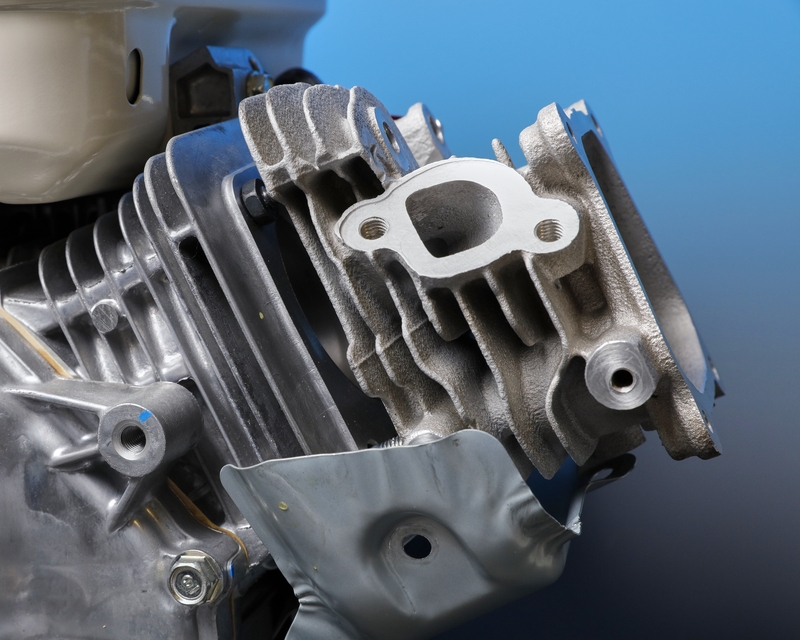 The company has been producing aluminum castings for customers in the military, automotive, aerospace, energy, medical, and industrial markets since 1948. The involvement of multiple national laboratories and industry via CMI’s interest in leveraging scientific knowledge to help solve critical materials issues was essential to fast development of the alloy. ORNL researchers led the development team while focusing on casting and microstructure property stability. Ames ran experiments on thermo-mechanical processing and examined the thermo-physical properties of the Ce-Al alloy. Lawrence Livermore performed characterization work using advanced microscopy and other methods. Eck was involved in pilot-scale experiments and provided manufacturing insight and expertise. CMI’s strategy is to bring together industrial, academic, and national lab expertise to address US reliance on critical materials like rare earth elements that are essential to energy, defense, and other manufacturing sectors. “It’s tough for a mine to survive if half of its output has no market. This alloy creates a use for the cerium that accompanies scarce and critical rare earths like neodymium and dysprosium,” said CMI Director Alex King. The Critical Materials Institute is a Department of Energy Innovation Hub led by DOE’s Ames Laboratory and supported by DOE’s Office of Energy Efficiency and Renewable Energy’s Advanced Manufacturing Office. CMI seeks ways to eliminate and reduce the risks associated with using rare earth metals and other materials critical to the success of clean energy technologies.